Say goodbye to your Allergies!!! 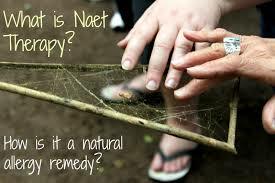 Discover NAET – A revolutionary treatment for allergies and allergy – related conditions. Dr. Devi Nambudripod, M.D., D.C., L.Ac, PhD. The innovator and developer of the successful NAET treatment protocol suffered from ill health and multiple allergies. In her quest to get better she tried different antibiotics and medications. Through trial and error, she noticed that by avoiding certain foods and other items, she had fewer symptoms, feel better, and had more energy. She also realized that the conventional medical treatments were not getting her well. She learned in her acupressure, kinesiology, and light touch chiropractic training. Through practice and time she discovered she could not only greatly enhance her health and eliminate her allergies but also those of her family and patients. She developed a synthesis of acupressure, Kinesiology and light-touch chiropractic to restore the body’s balance, to enhance healing, and to eliminate the body’s responses to allergens. the result is allergy-free better health! Allergies no longer need to be a hindrance in your family’s life and health. I am delighted to write this note of appreciation. When I scheduled my first first I could not breathe; my nasal passages were totally blocked. This condition has always plagued me during autumn, unless I was traveling out of state. The condition would dissipate after the year’s first hard freeze. For years I had dreaded the fall season and had to go to a doctor for a steroid shot, because over-the-counter and prescription medication simply did not work for me. At times it actually worsened my condition, and, alarmingly, caused unhealthy side effects. Admittedly, steroid shots would take care of the symptoms, at least through the fall season. But I would be back the following year with the same terrible condition: sleepless nights, extreme fatigue, inefficient labor, limited speech, total cutoff from outdoor activities. This year I decided to try something potentially more permanent and effective – NAET allergy elimination technique. After about 5 treatments, I began to sleep most of the night, soothing I had not been able to do in 14 fall seasons, without a steroid shot. As of today, with about 6 treatments yet to go, I feel great. Once again I am relishing the Texas fall, sleeping through the night, and using no medication whatsoever. And we haven’t had a hard freeze yet! ” I have a private practice that deals with patients with unsolved chronic illness. Based on the outcomes in my practice I have found that NAET is one of the most remarkable aids in healing that I have ever seen. As a medical professional who deals with extremely sick patients NAET is a godsend. Virtually all who receive it get benefit by their own attestation.” —–David Minkoff, M.D. ” My wife’s irritating, impossible Christmas tree allergy was eliminated by NAET. This method will revolutionize the current medical approach to allergy treatment for all people.” —–Dr. S. Inouye, D.D.S.,M.S.D. ” Dr. Devi’s technique has helped give my world-class athletes the winning edge” —-M. Greenberg, D.C.
” By using NAET treatment, I have been able to help our patients eliminate allergies that have been with them since childhood.” —–S.Ihlen, R.N. ” I have seen the most amazing things with the NAET technique from instant removal of daily, intractable headaches to near anaphylactic reaction to fish.” —–Robert J. Rowen, M.D. ” We just had a fantastic change in a patient using NAET. Sh had severe diabetes for two years and has been on two oral hypoglycemics and a very strict low carbohydrate diet. After completing NAET treatments, she has not had any diabetic medicine for over two weeks, and her sugars have remained normal! She has even started eating bread and potatoes and the sugar level remains within normal range.” ——David Minkoff, M.D. ” This allergy elimination technique is the most incredible practice tool I have seen in health care in my 40 years of practice.” ——John H.Kasler, D.C.
We treat people from infancy through maturity. Call us today at 817-795-7200 to schedule a consultation with our specialists to learn more about NAET .